The Miami Dolphins have most of the ingredients necessary to be a playoff contender. They can run the ball, they've got a pretty good offensive line, some nice receivers and one of the better defenses in the league. But Miami, like a handful of other NFL teams in similar situations, is lacking at one very important position; of course, we're talking about the quarterback. Last year sportsbooks sent the Dolphins off with a regular-season wins total of 8.5. Miami then opened last year with two road wins, led by former Michigan Wolverine Chad Henne at quarterback,. After alternating wins and losses for the next eight weeks to get to 7-6 and within sight of the playoffs, the Dolphins finished the season by losing three at home to Buffalo, Detroit and New England. Miami beat the Super Bowl champion Packers and the Jets, both on the road, but lost at home to such powerhouse outfits as the Browns, Bills and Lions. In fact, amazingly, the Dolphins went 1-7 at home last year, and 6-2 on the road. And they finished with a losing record despite outgaining opponents by an average of 14 YPG. The easiest place to put the blame on such a season is, of course, the quarterback. On the year Henne completed 61 percent of his passes, but for just a 15/19 TD/INT ratio and a 75.4 QB rating. This year it looks like Miami will again begin with Henne behind center, but that could change, at almost any moment. Over the offseason the Fish parted ways with RBs Ricky Williams and Ronnie Brown, among a few others, and QB Chad Pennington retired, for the time being. Miami then made a splash in trading for RB Reggie Bush, they signed LBs Jason Taylor and Kevin Burnett and OG Marc Colombo and re-signed NT Paul Soliai. The Dolphins also drafted Florida C Mike Pouncey, who's expected to step right in and start, at No. 15 overall, and they nabbed RB Daniel Thomas, who ran for 2,800 yards in two seasons at Kansas State, in the second round. Miami struggled on offense last year, ranking 21st overall and 21st in rushing at 103 YPG. Injuries played a part, but so did the personnel. 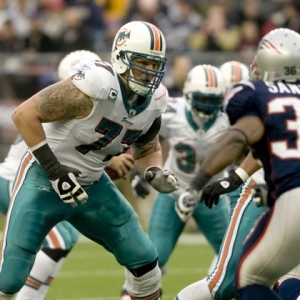 This year the Dolphins have the makings of a very good offensive line, with the addition of Pouncey and Colombo to a group that already included LT Jake Long and LG Richie Incognito. As of this writing Henne still tops the depth chart at QB, but former Carolina Panther Matt Moore looked good in Miami's exhibition opener. Bush is not a between-the-tackles kind of runner, so Miami might be forced to use rookie Thomas right away. This unit is the strength of this team, after ranking sixth overall last year and seventh vs. the run at 100 YPG. The Dolphins have just about everybody back on this side of the ball, and they add Taylor and Burnett. But if they want to contend in the AFC East this season they'll have to figure out a scheme for the Patriots, who put up 41 and 38 points on the Fish last year. Still, this should again be a solid unit this season. The Dolphins play six games this season against teams that made the playoffs last year, which includes, of course, two games vs. both the Jets and Patriots. Miami also has home dates with Houston and Oakland, and road games at San Diego, the Giants and Dallas. Overall Miami's schedule ranks tied for 10th-toughest in the league, based on last year's W/L records. BetOnline is lining Miami at +900 to win the AFC East this season, +2,000 to win the AFC and +5,500 to win the Super Bowl, with a regular-season wins ‘over/under’ of eight (‘O’ +160/’U’ -200). Playing in the same division as New England and New York, those division and conference odds are not worth taking. But if you think Henne (or somebody else) can give the Dolphins better production at the QB spot this year, that ‘over’ eight on the wins total (especially getting a price like +160) might be worth a shot.